The Zenith El Primero was the first automatic chronograph caliber in the world. Oscillating at a high frequency, this movement can measure 1/10th of a second. Current top models are made of gold and have a tourbillon and skeletonized movement. The El Primero (Spanish for "the first") is inextricably tied to the Swiss watch manufacturer Zenith. The caliber rocketed the company to fame and earned them a place in the history books. The El Primero was introduced in 1969, making it the first automatic chronograph caliber worldwide. Thanks to its unusually high balance frequency of 36,000 A/h (5 Hz), it can measure 1/10th of a second – an ability that, to this day, remains a rarity in mechanical chronographs. In spite of this high balance frequency, the movement runs for 50 hours once fully wound. In comparison, ETA's Valjoux 7750 only has a power reserve of around 44 hours. This movement is the most frequently used automatic chronograph caliber in the world. Today, Zenith is a master of timekeeping, offering ultra-precise watches such as flyback and double chronographs. Current top models from Zenith using the El Primero caliber have skeletonized movements with a tourbillon and are made of ceramic or rose gold. If the skeletonized movement isn't a requirement for you, you can go for an El Primero Tourbillon instead. This model is available in stainless steel, titanium, or 18-karat rose gold. Tech lovers will be taken with the Defy El Primero 21 , which was introduced in 2017. The watch features two escapements: one for displaying time and the other for the chronograph function. The chronograph escapement vibrates at 50 Hz, ten times the speed of the standard El Primero. Its speed allows it to measure 1/100th of a second. This is an exceptional achievement in the world of mechanical watches. 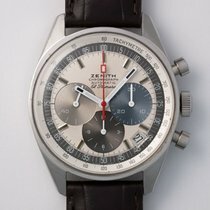 How much does a Zenith El Primero cost? 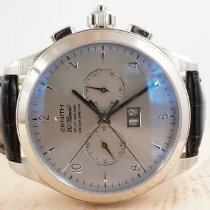 Pre-owned Zenith chronographs with an El Primero caliber are available at comparably affordable prices. Models from the 1990s in good or very good condition start at around 1,500 euros. Gold watches from this time are only a bit more expensive, ranging between 1,700 and 2,000 euros. If you're looking for a wristwatch with an automatic in-house caliber and stopwatch function, then the Zenith El Primero could be the right fit for you. Models from the 90s are very affordable. Prices for models from the 1980s start at around 2,300 euros, but can go up to and over 6,000 euros. The more expensive models have an 18-karat gold case and are powered by the caliber 3019PHF. The movement features a moon phase display as well as a complete calendar. A complete calendar displays the date, the day, and the month, but needs to be manually corrected during months with less than 31 days. The timepiece is also known as the El Primero 410. Without the calendar function, a pre-owned vintage watch from the 80s costs between 3,200 and 3,800 euros. Early models from the first year of their release are often appealing to collectors. A Zenith El Primero in good condition from 1969 can be purchased for as little as 5,000 euros. Models in very good condition cost 6,000 euros, while gold versions start at 8,500 euros. 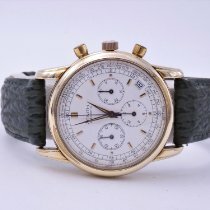 Compared to other vintage chronographs, the Zenith watch is very affordable. A Heuer Monaco from 1969 costs at least 13,500 euros. The Calibre 11, another one of the first automatic chronograph calibers, powers these chronographs. Stainless steel Rolex Daytonas from the 1960s, which are manual, often cost over 50,000 euros. Both of these examples show the relative affordability of a pre-owned Zenith El Primero. New watches with the El Primero cost less than 4,000 euros. The 38-mm Chronomaster El Primero 38.00 timepieces come closest to the first watches from 1969. Prices for new stainless steel variants (03.2150.400/69.C713) start at around 4,800 euros. Retro models with an 18-karat rose gold case cost around 10,000 euros. Stainless steel versions with a partly skeletonized dial, called the El Primero Open, cost around 6,500 euros. This model gives you a view of the escapement and swing systems. If you want to be able to marvel at the movement from the front and back, then you should take a look at the Full Open variant. Stainless steel Full Opens cost about 7,200 euros. The El Primero Grande Date with an oversized date display is in the same price range. Top Zenith El Primero models are made of rose gold and feature a tourbillon, which increases a watch's precision by compensating for gravity-related deviations from the correct time. The model with reference number 18.2280.4035/01.C713 costs almost 55,000 euros new. The version with a titanium case costs 10,000 euros less. The Chronomaster El Primero Tourbillon Skeleton is available with a lightweight, hard, and scratch-resistant ceramic case. Additionally, the dial and movement are skeletonized. You should be prepared to spend at least 33,000 euros on this black watch. Rose gold models cost around 48,000 euros. One highlight from the Le Locle-based manufacturer is the Chronomaster El Primero Tourbillon GFJ . The last three letters, GFJ, are the initials of the company's founder, Georges Favre-Jacot. Zenith introduced the model in 2015 in celebration of the company's 150th anniversary. This wristwatch has Zenith's first tourbillon movement that uses a fusée-and-chain transmission. This system ensures a constant driving force and thus incredible precision. The El Primero Tourbillon GFJ is available with a ceramic or 18-karat rose gold case. The rose gold version costs over 70,000 euros new. The majority of the chronographs using the Zenith El Primero have a sporty-elegant design. Therefore, most of them are perfect everyday watches that you can wear to the office or in your free time. Some timepieces, on the other hand, are true sports watches , such as the Zenith El Primero Stratos Flyback. It has a rotatable bezel and flyback function. You can purchase this model pre-owned for around 4,000 euros. Prices for new models start at around 5,400 euros. The El Primero Stratos Flyback Striking 10th (03.2060.4057/69.C714) is an particularly special watch; its central stopwatch seconds hand only needs 10 seconds to make a complete rotation. This mechanism makes it easier to read tenths of seconds. Usually, this hand needs 60 seconds to rotates 360 degrees. You should be prepared to spend at least 5,700 euros on this watch. The El Primero Rainbow is also a popular model among fans. The manufacturer developed the Rainbow in the 1990s based on the needs of the French military. The company introduced the pilot's watch to the market in 1997. These Rainbow timepieces feature a multi-color 30-minute counter at three o'clock, a red chronograph seconds hand, and a rotatable bezel. The first 20 minutes of the scale on the bezel are in red. Using the telemeter scale on the rehaut, the edge of the dial, you can calculate distances. Models from the 90s often cost less than 3,000 euros. Current versions of the Zenith El Primero Stratos Flyback Rainbow are 45.5 mm large and cost 6,000 euros new. Nineteen sixty-nine was a significant year in many aspects. That summer, the first men landed on the Moon with the Omega Speedmaster Professional Moonwatch on their wrists. Richard Nixon became the 37th President of the United States, and the Woodstock Festival went down in music history. There were also historical moments happening in the watch world, such as the competition to create the first automatic chronograph caliber between Zenith, Seiko, and a team made up of Heuer, Breitling, Büren, and the chronograph specialists Dubois Dépraz. Breitling and Heuer began developing an automatic chronograph caliber in the early 1960s, as standard manual movements were becoming less and less popular. Automatic movements, which made regularly winding your watch a thing of the past, were gaining in popularity. Heuer, Breitling, Dubois Dépraz, and Büren joined together to tackle the challenge of creating an automatic chronograph caliber. The result was the Calibre 11 with a chronograph module and micro-rotor. Due to technical reasons, the crown was on the left side, while the push-pieces for starting and stopping the chronograph were on the right. The movement was presented in March 1969. Zenith had introduced their El Primero in January 1969. Unlike the Calibre 11, the El Primero was an integrated chronograph movement. That meant that the movement was designed for the purpose of timing and its components fit perfectly together. The Calibre 11 had a chronograph module that was mounted onto the base movement. The Zenith El Primero, however, first came to market in the autumn of 1969. The Japanese manufacturer Seiko sold the first wristwatches with automatic chronograph movements in the early summer of 1969.